The Northeast Arlington Reading Group has taken on the daunting task of reading Ayn Rand’s 1,100-page opus Atlas Shrugged. It is a particularly timely pick, because although the book was published in 1957, the philosophy espoused has been cited frequently in recent months by conservative commentators and opponents of President Obama’s economic policies. Atlas Shrugged tells the story of an alternative America in which the government manipulates the economy by directing resources and money-making opportunities to people with the most perceived “need,” at the expense of the most successful industrialists. The captains of industry, realizing that all their efforts are being spent to the benefit of others, stop producing and instead go into exile. The people who keep the world running, who hold up the world (read: Atlas), drop that responsibility (read: shrug). Parallels have been drawn between the government’s actions in Atlas Shrugged to the current government’s bailout of failing banks, insurers, auto companies, and other industries. Critics of the Obama Administration’s plans to raise taxes for people earning more than $250,000-a-year to a pre-2000 level and to help homeowners facing mortgage default make comparisons to the successful people in Rand’s book being forced to keep the unsuccessful afloat. Some people even talk about “Going Galt,” that is, abandoning their profit-driven enterprises to no longer pay for government programs they consider take advantage of their success. Or a more extreme option, by living off the grid. But even some Rand acolytes see glaring differences between her vision and the current financial crisis. Former Federal Reserve Chairman Alan Greenspan, who was once a member of Rand’s “inner circle” and wrote articles for her magazine, told a congressional hearing in October, “Those of us who have looked to the self-interest of lending institutions to protect shareholders’ equity – myself, especially – are in a state of shocked disbelief.” Then in February he came out in support of at least temporarily nationalizing banks. Libertarian author and once-candidate Jerome Tuccille told The Washington Independent that Rand didn’t address the behavior of capitalists like Merrill Lynch’s John Thain who let his company falter while paying himself a huge bonus. On Forbes magazine’s website, economist John Tamny lamented the decisions of several entrepreneurial companies like Intel, Cisco and Microsoft to seek government grant money through the economic stimulus package. Libertarian columnist Will Wilkinson compared the “Going Galt” movement by conservatives to the “If Bush wins I’m moving to Canada” mentality of liberals. 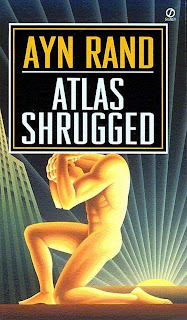 The easiest way to Go Galt: attend the Northeast Arlington Reading Group discussion of Atlas Shrugged at the Northeast Branch Library on Tuesday, June 9 at 7 p.m. You can keep your job and your worldly belongings.